The City of Stuttgart commissioned Michael Singer to design and construct a one acre garden within Killesberg Park. The garden was conceived as a series of enclosed and layered spaces for remembrance. The project is defined by two primary spaces, one a shaded area and one opening to the light. The spaces are enclosed by vegetation and sculpted wood gates. Two existing small streams converge at the site, augmented by three wells designed by Singer. The water collects in quiet pools, revealing sculptural forms and chambers below the surface. 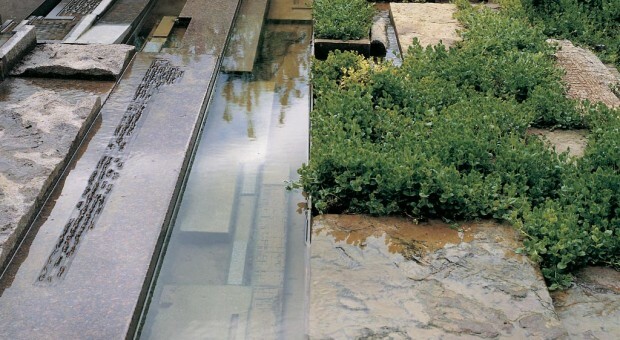 In effect, the sculptural pools and wells slowly cleanse and aerate the water as it moves through the garden. Pockets of native vegetation are built within the pools and emerge as though from a layer of earth beneath the water. While most of the water in the garden seems still, the passage of the water can be heard moving in concealed troughs throughout the garden. Architectural Record editor Cliff Pearson wrote an article about the garden in the July 2002 edition of the magazine on memorials and memorial spaces.